“David Bowie – TopPop 1974 08” by AVRO – Beeld En Geluid Wiki – Gallerie: Toppop 1974. Licensed under CC BY-SA 3.0 via Commons. Yesterday the Berklee Digital Learning offices, like probably every other administrative office at the college, was abuzz with the news of David Bowie’s passing. As each new person trickled in for the day, the animated conversation about Bowie began anew. No one could believe it, and everyone talked of him as if they knew him. He had mattered in all of our lives. I’m not a person who feels a personal connection to any celebrity, and call me cold but celebrity deaths rarely move me. Bowie was different, though. As I listened to my musician coworkers and watched the umpteen billion Bowie Facebook posts, I realized that he was different to many, if not all, of us. It only confirmed what I wrote when I first heard about his passing: That we mourn Bowie’s passing not just because of who he was and what he did, but because of what he represented. 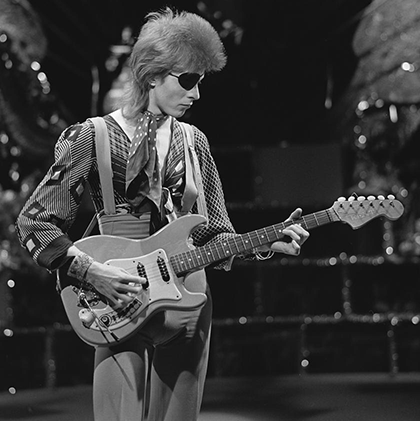 To me, Bowie represented unbridled creativity and the power of authenticity. Isak Kotecki is a 3rd semester CWP major at Berklee College of Music. He is a singer/songwriter, composer, and filmmaker from Austin, Texas. About two weeks into my 3rd semester here at Berklee, I received an oh-so-sweet email. It was a beautiful, flickering light in a daunting sea of darkness. A sea of darkness filled with phone-a-thon job offers and ramen budget dinners. A dark abyss that could only be illuminated by the beacon of hope that is, the Digital Learning Department (DLD). Will Ponturo is a 9th semester Composition student at Berklee. He is currently a Multimedia Audio Assistant work-study for the Digital Learning Department. I’ve been a work-study with the Digital Learning Department (DLD) since late spring, and in that time I’ve learned more and grown closer to the Berklee community than I ever could have expected. When I first received the email about an opening for the Multimedia Audio Assistant position, I knew I would be a great fit. The description was very detailed and outlined a lengthy list of abilities that would be required of me. This included proficiency with audio and video editing software, camera operation, recording and sound equipment, and something called “communication skills,” but I wasn’t sure what that was. Although it is technically an audio job, I was asked to be knowledgeable of all types of media. The description sounded like a dream job for me, as I have always had a passion for video. When I chose to attend Berklee, I feared that in a way I was choosing music over film. I knew the rigorous academic demands of Berklee had the potential to push my desire for filmmaking to the periphery. I never thought I would be able to utilize my knowledge for filming and editing in the Berklee atmosphere, but this position came to the rescue. My duties as Multimedia Audio Assistant are incredibly diverse. The main aspect of my job is working on blended and online course media for Inside Berklee Courses. This consists of editing audio and video, as well as recording audio on our many on-location shoots. I typically work with Adobe Premiere for video and Pro Tools or Logic for audio. Also, the DLD has a high quality selection of recording gear that I use for the video shoots. I began with a strong proficiency for the gear and software, but this job has helped me become so much more efficient with these tools, developing skills I can carry beyond this work-study position. This summer, the Digital Learning Department constructed an online Music Therapy Masters Degree program, during which I performed several tasks regarding the media in the different courses. The most exciting of these responsibilities was being a part of the video shoots. The location of each shoot was always different – as close and familiar as the Berklee Loft, and as distant as a private home in Worcester, MA. I recorded sound on these video shoots, using a variety of microphones and recording techniques. I attached a lav mic to each person being interviewed, determining the exact placement and technique according to what the subject was wearing. In addition to the lav, I set up a boom microphone to capture the room sound and to help even out the different cuts during the editing process. All the mics plug into a handheld Zoom H6n recorder, which is insanely portable. I’ve pushed the portability to the max, sometimes curling up in the corner of a hospital room or laying it all on my lap while sitting on a couch, always adapting to the needs of the location. I work for a talented team of people to help make these interviews look great and provide the content we need to enhance the courses. These shoots are especially enriching because of the new people I constantly meet. During the course of the music therapy shoots I have met the most inspiring people, many of whom had been diagnosed with life-threatening illnesses. They talk about life with such immense gratitude for each new day, it makes me put my own life in perspective and rethink the troubles I think I have. These video shoots also introduced me to professors who are very knowledgeable in their respective fields, and I can’t help but digest the information they present on camera. The aspect of this job that impresses me the most is the trust and respect everyone in the office shows me. It doesnt feel like I’m treated any different from the rest of the employees in the office. Instead, I am given important responsibilities and often asked for my opinion about certain projects. I truly feel like a part of the team, not a student outsider. It is because of this mutual respect that I can truly enjoy coming to work, and put effort into the content I help create. The coffee and tea selection doesn’t hurt either. From L-R: Will Ponturo (Multimedia Student Assistant), Audrey Harrer (Associate Creative Director), Jeannie Greeley (Senior Multimedia Producer). Taken at Boston Children’s Hospital. From L-R: Karen Wacks (Music Therapist), Will Ponturo (Multimedia Student Assistant), Audrey Harrer (Associate Creative Director), Jeannie Greeley (Senior Multimedia Producer), Rachel Santiago (Speech-Language Pathologist). Taken at Boston Children’s Hospital. In this post, I interviewed Enrique Gonzalez Müller, Assistant Professor in the Music Production and Engineering Department at Berklee. He taught MP-P305 Record Production for Producers, the capstone class for the MP&E Minor, last semester. Enrique holds a dual degree from Berklee in MP&E and Music Synthesis. He is a producer, recording engineer, and arranger who has worked with many independent, national and international artists. He is a Latin Grammy-winning producer for Los Amigos Invisibles, a member of the education committee of the San Francisco chapter of the Grammys, and volunteer faculty for the Prison University Project at San Quentin Prison. In this discussion, we talk about how web conferencing benefited his MP-P305 class during this past winter, when snowstorms were plentiful. Nazli: What did you use Google Hangouts for? Enrique: Using Google Hangouts came out of necessity since we had so many snow dates at the beginning of this semester! The very first Wednesday, we had to cancel class due to a storm and I had a production course where students needed to jump in right away, find an artist, get a bunch of songs to be considered for their productions and send those back to me for approval. If we had missed one week, it would have been really tough for my students to get caught up. So I thought on my feet and decided to use Google Hangouts, since it can do video conferencing with up to fifteen people meeting at once [ed. note: ten is the maximum number of users, fifteen is the maximum for the version that Berklee is using.] Just hours before class, when it was snowing and we knew we couldn’t make it to campus, I sent everyone an email and gave them instructions on how to use Google Hangouts to conduct our class. In a few minutes, we were all up and going and didn’t miss a beat! We went through the syllabus, the assignments, and went through introductions with everyone. I got a chance to get serious with the students too and set the tone for responsibility (as well as have a laugh!). The thing that I found pretty cool was not only that we did class, but we also were all operating on the same platform. I’d have the list of questions and materials on different parts of my screen so that I could easily maneuver and share with my students. In our back and forth, I could have everybody do the same thing by just saying something like, “Ok, so lets all go to our course page and go to assignment 3 tab on this,” and it was just super practical and fun. I wound up doing it for every snow date that we had…which ended up being two or three!